Prospero Silver (TSX-V:PSL) signed the previously announced option agreement with Fortuna Silver Mines relating to the Pachuca SE project in Hidalgo, Mexico. The Oreninc Index fell in the week ending January 25th, 2019 to 20.23 from 28.08 although the number of financings increased. On the political front, US President Donald Trump agreed to temporarily reopen the US government, bringing an end a 35-day shutdown, as he signed a bill that will fund government for three weeks. The bill did not include any funds to build a wall on the frontier with Mexico that the president had demanded and is viewed as a defeat for him. It is estimated that the shutdown cost the US economy more than the US$5.7 billion funding the president sought for the wall. Turbulent times around the world continue. In addition to the ongoing conflict in Syria, as the US and Taliban start talking about the possibility of a peace deal in Afghanistan, Afghan president Ashraf Ghani said that since 2014, some 45,000 members of local security forces have been killed in the conflict. Now, Venezuela is also moving towards a moment of truth as lawmaker Juan Guaidó declared himself as president of the country in direct opposition to incumbent president Nicolas Maduro, who recently began his second term following elections widely perceived as fraudulent. The US and most of Latin America quickly recognised Guaidó as the head of state whilst Russia its block reaffirmed their support for Maduro. Precious metals began the week in the doldrums as gold fell away from the US$1,300/oz mark, but rebounded strongly as the week ended to break through that psychological barrier. 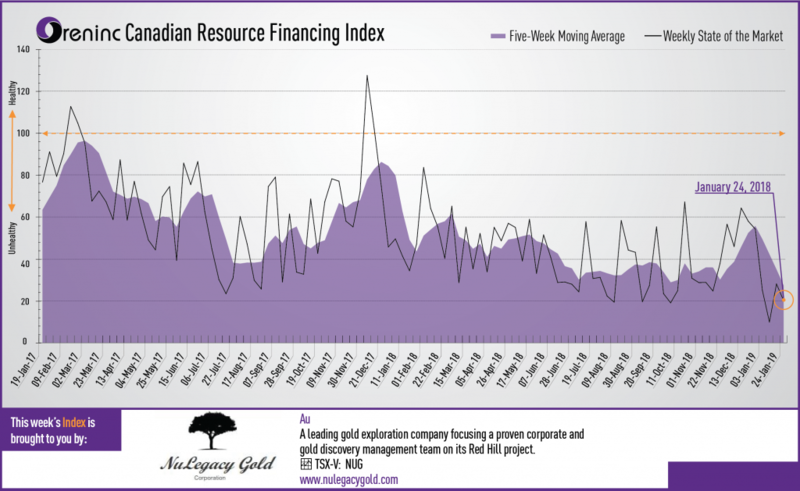 The week commenced with the Vancouver Resource Investment Conference, the first major mining and metals conference of the year, where Oreninc presented some of its insights about capital raisings in Canadian capital markets. Whilst there were many more companies exhibiting this year the event felt busy rather than crowded. On to the money: total fund raises announced decreased to C$19.4 million, a two-week low, that included no brokered financings and no bought-deal financings. The average offer size more than halved to C$1.02 million, a two-week low, whilst the number of financings increased again to 19, a three-week high. Gold finally broke the US$1,300/oz mark to close the week up at US$1,305/oz from US$1,282/oz from US$1,290/oz a week ago. The yellow metal is up 1.77% this year. The US dollar index fell to close down at 95.79 from 96.33 last week. The van Eck managed GDXJ followed the gold price down and closed the week up at US$30.60 from US$29.33 a week ago. The index is up 1.26% so far in 2019. A similar tale at the US Global Go Gold ETF that closed up at US$11.77 from US$11.30 a week ago. It is up 3.16% so far in 2019. The HUI Arca Gold BUGS Index closed up at 154.64 from 150.77 last week. The SPDR GLD ETF inventory saw no movement as it closed the week still at 809.76 tonnes. In other commodities, silver returned to growth to close up at US$15.77/oz from US$15.34/oz a week ago. Copper added a cent to close up at US$2.71/lb from US$2.71/lb a week ago. Oil gave up some ground as WTI closed down at US$53.69 a barrel from US$53.80 a barrel a week ago. The Dow Jones Industrial Average continued in growth mode to close up at 24,737 from 24,706 last week. Canada’s S&P/TSX Composite Index also continued to grow as it closed up again at 15,366 from 15,303 the previous week. The S&P/TSX Venture Composite Index closed up at 604.56 from 595.51 last week. Number of financings increased to 19, a three-week high. No bought-deal financings were announced this week, a one-week low. Total dollars decreased to C$19.4m, a two-week low. Average offer size diminished to C$1.02m, a two-week low. Platinum Group Metals (TSX:PTM) announced a US$4.0 million private placement. Net proceeds to be used for the company’s share of the remaining costs to complete a feasibility study for the Waterberg palladium and platinum project in South Africa. Fireweed Zinc (TSX-V:FWZ) announced a non-brokered private placement for gross proceeds of up to C$5 million. 2 million shares @ C$0.80 and 890,000 flow-through shares @ C$0.95 and 2.2 million flow-through shares @ C$1.10. It includes a lead order of 2.2 million shares by strategic investor Teck Resources that will increase its interest in Fireweed from 4.7% to about 9.9%. The net proceeds will fund the 2019 work program focused on exploration and resource expansion at its Macmillan Pass project in Yukon, Canada. Platinum Group Metals (TSX:PTM) opened a C$33 million offering on a best efforts basis. Global Atomic (TSX-V:GLO) opened a C$5 million offering on a best efforts basis. Each unit includes a warrant that expires in one-and-a-half years. The deal is expected to close on or about January 31st. Klondike Silver (TSX-V:KS) opened a C$2 million offering on a best efforts basis. Each unit includes a warrant that expires in five years. Barksdale Capital (TSX-V:BRO) closed a C$5 million offering on a strategic deal basis. Royal Nickel (TSX:RNX) closed a C$15 million offering on a bought deal basis. Impact Silver (TSX-V:IPT) closed a C$5 million offering on a best efforts basis. Fortuna can acquire up to a 70% interest by spending US$8 million in qualifying expenditures and completing a preliminary economic assessment, with a minimum $1 million spend in the first year. Drilling of a six-hole, 4,200m program began in January to test a number of potential vein targets. In 2018, Prospero, with financing provided by Fortuna, drilled 1,800m in three holes testing three distinct targets with deep, angled holes. The 2018 program appeared to successfully cut the upper parts of a series of blind epithermal veins hosting silver and gold mineralization, which is exciting given the proximity of the project to the historical Pachuca-Real Del Monte camp. Phase 2 will follow-up on the 2018 hits and test additional altered structures, providing the potential for drilling result catalysts for the stock price.